In a wide-ranging and sometimes defiant letter to staff announcing his resignation on Friday, Energy Secretary Steven Chu, while highlighting his agency's achievements over the last four years, blasted critics of the administration's investments in the renewable energy market, suggesting that opponents were living in the "Stone Age." "In the last two years, the private sector, including Warren Buffett, Bank of America, Wells Fargo and Google, have announced major investments in clean energy," Chu wrote. "Originally skeptical lenders and investors now see that renewable energy will [be] profitable. These investors are voting where it counts the most -- with their wallet." The department's support of renewable energy projects like wind and solar power has been at the the heart of Republican attacks on Chu's tenure -- particularly his oversight of clean-energy incentives and subsidy programs created or expanded under President Barack Obama's 2009 stimulus package, which counted among their beneficiaries the failed solar firm Solyndra. But in his salutary epistle to staff, Chu waved off those criticisms as being willfully blind to the larger successes these various programs delivered -- and to the nation's obligation to continue pursuing them. "While critics try hard to discredit the program, the truth is that only one percent of the companies we funded went bankrupt. That one percent has gotten more attention than the 99 percent that have not," Chu said. "The test for America’s policy makers will be whether they are willing to accept a few failures in exchange for many successes. America’s entrepreneurs and innovators who are leaders in global clean energy race understand that not every risk can –- or should –- be avoided." Quoting Michelangelo, Chu added, "'The greater danger for most of us lies not in setting our aim too high and falling short; but in setting our aim too low, and achieving our mark.'" News of Chu's planned departure had begun circulating even before Obama's re-inauguration last month. But Friday's memo to staff by the physicist and Nobel laureate -- among the longest-serving energy secretaries -- was still disappointing to many clean-energy advocates. "Secretary Chu has led the Energy Department at a time when our nation made the single largest investment ever in clean energy and doubled our use of renewables," said Gene Karpinski, the president of the League of Conservation Voters, in a prepared statement. "He has proven himself to be one of the world’s greatest scientists and an ally in the fight against climate change." Matthew Stepp, a senior policy analyst with the Information Technology and Innovation Foundation, echoed that sentiment in an email Friday afternoon. "While there is still significant work to be done, no one can deny that the Department of Energy is better equipped today to develop and commercialize breakthrough clean energy technologies than four years ago. The Secretary should be applauded for continuing and strengthening the long American legacy of leadership in developing world-leading technologies which now includes shale gas, advanced solar, wind energy, and next-generation batteries." Chu's term at DOE was often tumultuous, however, and he was a frequent target of criticism from Republicans in Congress or their patrons among legacy fossil fuel interests, business groups, climate skeptics or free-market think tanks -- many of whom saw Chu as the embodiment of what they consider the administration's wasteful support of expensive or underperforming energy technologies. Republicans grilled Chu last year as part of a lengthy investigation into Solyndra and the $535 million loan guarantee it received from the Department of Energy. "This is disgusting. This happened under your nose," Steve Scalise, a Louisiana Republican, told Chu at a House Energy and Commerce committee hearing in late 2011. "I'll hope you'll go back to your agency and have some heads roll." A year-long probe into the Solyndra loan found that while the deal's approval may have been hasty, no evidence of wrongdoing or, as many administration critics suggested, political favoritism in pushing the loan out the door, was ever turned up. Still, Chu's detractors did not mince words on Friday. "Good riddance," declared the Climate Depot blog in response to Chu's announced departure. The site is run by the right-wing Committee For A Constructive Tomorrow, which aggressively challenges basic climate science. Daniel Kish, the senior vice president of the free-market Institute for Energy Research, appeared to blame the energy secretary for worsening the recession. "Under his watch, energy consumption in the United States declined by 2.24 percent while our leading economic competitor, China, increased energy consumption by 28 percent," Kish said in a statement published to the IER website. "Similarly, GDP growth in the United States has limped along at the anemic annual rate of 0.6 percent while China’s economy has soared at the annual rate of 9.12 percent, more than 15 times our own. Clearly, the policies and priorities of Steven Chu’s energy department have benefitted our global competitors and intensified the economic pain felt by millions of unemployed Americans." But such sentiments were in the minority, and many commenters saluted Chu's oversight of billions of dollars in efficiency and clean-energy investments. "The programs that he supervised during his tenure, like the SunShot initiative, advanced energy research, and the Weatherization Assistance Program, have kept America on the map in the competitive global marketplace and protected middle-class families from rising energy costs," said Carol M. Browner, former director of the White House office of Energy and Climate Change Policy and now a senior fellow at the left-leaning Center for American Progress. "The next secretary of energy must maintain Chu’s dogged focus on using all of the Energy Department’s tools in the fight against climate change -- especially its financial resources and significant convening power." Indeed, Chu concluded his letter by scolding those who dismiss the need to pursue cleaner forms of energy and to curb greenhouse gas emissions. The basic science behind climate change and humanity's contribution to it, Chu said, is clear. And while the rate of global warming -- and its precise impacts in coming decades -- cannot be known with certainty, the risks of inaction are large. 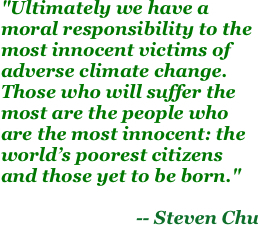 "Ultimately we have a moral responsibility to the most innocent victims of adverse climate change. Those who will suffer the most are the people who are the most innocent: the world’s poorest citizens and those yet to be born," Chu said. "There is an ancient Native American saying: 'We do not inherit the land from our ancestors, we borrow it from our children,'" he added. "A few short decades later, we don’t want our children to ask, 'What were our parents thinking? Didn’t they care about us?'"